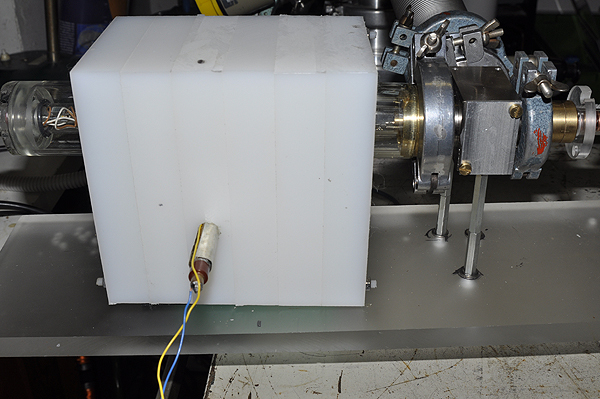 I justed finished a small neutron source for detector testing. The function was proved with indium- and silver-activation. 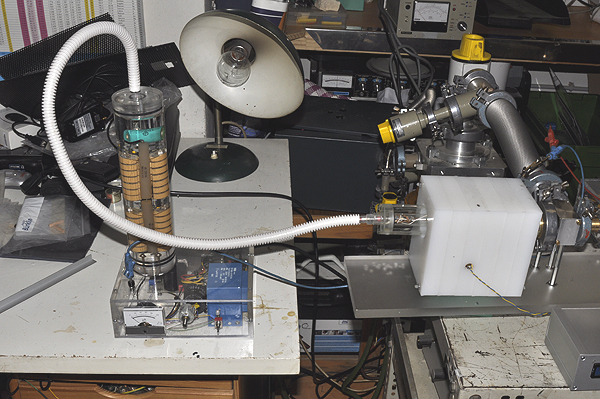 The source works with a simple canal-ray ion source and a titan target. The working gas is deuterium from a lecture bottle. The accelerating voltage is arround 100 kV, the target current only some 10th microamps. Both HV-supplies, for the ion source (max 25kV) and accelerating (max 120kV) are simple homemade device, flyback inverters with voltage multipliers. The moderator is made of PE-HD. In spite of the low power and current the activation is remarkable, 90 counts for silver and 30 counts for indium. The plastic hose and the small design does solve a lot of Isolation issues - congratulation! I can't see the RF generator for the ion-source - or am I missing something? How did you solve the isolation problem between the RF coil and the next KF fitting? the copper coil you see is not a rf-coil but a capillary tube to feed the deuterium to the canal ray ion source. 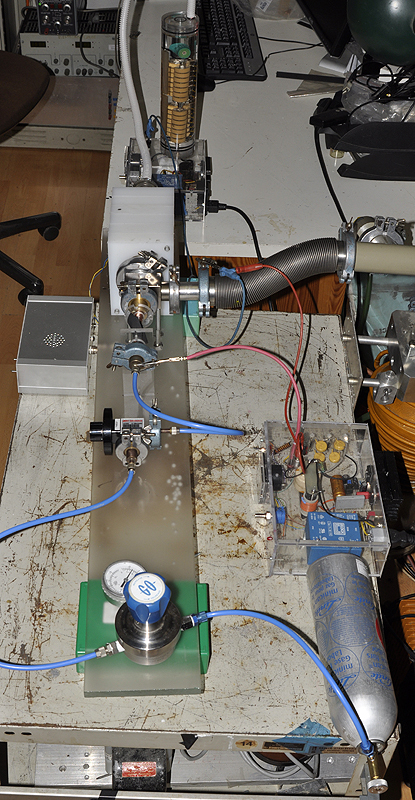 The ion source is driven by dc current (20kv, about 200..300µA). Construction drawing will following. Nice work, Rapp, your posts are always an enjoyable read. Really sweet beam on target fusion effort! Thanks for your continuing efforts and sharing with the group here. It looks as if the system is, effectively, differentially pumped due to the fine holes in the anode and cathode to the right as the glow in the right half seems rather bright, (higher pressure) and the deuteron stream is nice an dull pink in color, (lower pressure). Am I correct here? you are quite correct. Mostly because of the fine cannel in the cathode the pressure in the accelerating space is low enough. Otherwise there would be a discharge between cathode and the suppressor. The fine hole in the anode and the long capillary (0.8 mm ID, 50cm long) helps to regulated the pressure with the throttle valve . I'm using a similar device to prevent the plasma from igniting through from the chamber back to the MFC. It's just a small piece of tiny steel pipe, connected to a KF seal ring. I think I will call it "plasma backdraft restrictor - design ENGEL"
I think Steven Sesselmann could also use it. I always liked well thought out differential pumping schemes that relied on controlled leaks between chambers, rather than two pumping systems.